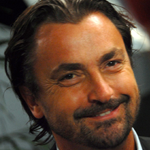 Former French Open finalist and French Open doubles winner Henri Leconte looks ahead to the 2016 Apia International Sydney and the Legends of the Game. Happy New Year everyone! I hope you had a good break and you’re ready for some awesome tennis in January in Australia! I know I am! The Apia International Sydney 2016 is one of the oldest tournaments on the Tour and has a fantastic history. It will take place at the Sydney Olympic Park Tennis Centre from 10 – 16 January 2016 just the week before the Australian Open in Melbourne. I’ve played there three times in my career and I was very happy to be invited back to play in the Legends event last year and again this year. The Apia International Sydney is part of the Australian Open Series which also includes the Hopman Cup in Perth, the Brisbane International, the Hobart International and the World Tennis Challenge in Adelaide. Swede Mats Wilander, Australian favourites Pat Cash and Mark Philippoussis, and me as the entertainer plus our lovely ladies Martina Navratilova and Arantxa Sánchez Vicario make up the Legends field at Apia International Sydney 2016. Jonny Mac, otherwise known as John McEnroe, who faced off against two-time US Open winner and former Australian Davis Cup captain Pat Rafter in front of a sold out crowd in January 2015 wanted to return to the Ken Rosewall Arena on Friday, 15 January but he can’t. The multiple Wimbledon and US Open champion was scheduled to meet me, or as the Aussies call me, ‘the French entertainer’ this time around in a FAST4 Tennis match ahead of the women’s final. I had eight tough matches in my career against John around the world and unfortunately he had to cancel due to injury. I wish John all the best to get well soon! John said about our match in December to a UK journalist: ‘Henri has always been a tough opponent so I am working hard to be able to bring my best tennis to Sydney!’ It is really sad that he had to withdraw. Hopefully we’ll try again next year. Because of John’s cancellation we had to change some of the matches. For example, on Saturday night, Marky Mark (Philippoussis) was scheduled to take on Wimbledon record-holder Goran Ivanisevic ahead of the men’s final. But now Goran will play in Brisbane versus Pat Cash. As for me, I had a great time playing at the Apia International Sydney last year, so I am really looking forward to returning. I’ve always enjoyed playing in Sydney, in front of some of the best tennis fans in the world and I love coming to Australia in January, it’s summer and I have an advantage over the other guys because I won the Sydney tournament in 1985! Also, I experienced one of my funniest (or strangest, depending on how you look at it) moments on court but I’ll get to that at the end! Martina Navratilova held the world No.1 ranking for a total of 332 weeks in singles and 237 weeks in doubles, making her the only player, male or female, to have held both top spots for more than 200 weeks. On top of her 18 Grand Slam singles victories, she won an incredible 31 Grand Slams doubles, 10 Grand Slams mixed doubles and four Fed Cup titles. Sanchez Vicario also had success in doubles, adding six doubles and four mixed doubles Grand Slam titles to her four singles titles. Nicknamed the ‘Barcelona Bumblebee’ for her refusal to concede a point, she led Spain to their first Fed Cup title in 1991 and holds the record for most matches won and most ties played in Fed Cup history. Oh my God, that is a serious record of success! Mark and I can relax, the ladies will save us! They are still very good tennis players, much better than the two of us! Wilander is one of only two men, the other being Rafa Nadal, to have won at least two Grand Slam singles titles on every surface. Although he didn’t win Wimbledon, he won two Australian Open titles when it was played on grass and one on hard court. The 51-year-old Swede will face off against Pat Cash in a Legends match to open the FAST4 event, before captaining his side through two singles and one doubles match against the Australian team. So, back to my funniest moment on court…it’s strange but completely true! So, who else is coming to Sydney to play some tennis? We have some of the most talented youngsters in the world and we have two star-studded line-ups. For the women, Simona Halep is the top seed while Petra Kvitova, Agnieszka Radwanska, Caroline Wozniacki, Flavia Pennetta, Garbine Muguruza, Lucie Safarova, Sabine Lisicki and Andrea Petkovic are all coming. For the men, we will have the top seed in Bernard Tomic as well as Fabio Fognini, David Goffin, Philipp Kohlschreiber, Nick Kyrgios, Sam Groth and Juan Martin del Potro. Will see what will happen this year in Sydney. Here we come again!